One of the most controversial elements of the strategy proposed by European Alternatives, Transeuropa and DiEM25 has to do with understanding the role of the nation-state. TRANSEUROPA WHAT’S AFTER THE NATION STATE? Thoughts for a future below and beyond the nation on Saturday 28 from 16:00 to 21:00 in Madrid. Joan Pedro-Carañana. 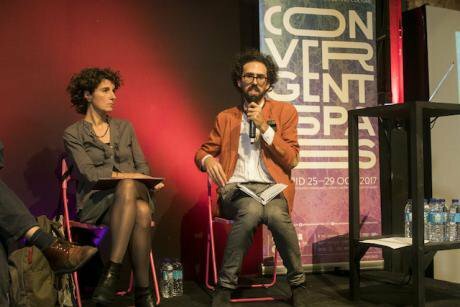 All rights reserved.Activists from around Europe met at Transeuropa festival in Madrid, 25 – 29 October to discuss projects of pan-European solidarity. What can be expected from the strategy for social, cultural, political and economic change it promotes? What can be done with the nation-state? What can convergence achieve? What about the working class? The forces on the left around Europe have been in deep crisis since neoliberal globalisation took off in the 1980s. Progressive and radical forces have been unable to respond effectively to the transformations in the structure of capitalism and the elite control of ideological institutions. The result has been an intense concentration of the “international oligarchy” and the development of more unequal power relations. The consolidation of new sources of power in the financial and technological systems has promoted further consent on the part of a large section of the middle and working classes to the established system. As the left(s) and the working class moved further away from each other, neoliberalism and nation-states provided what Raymond Williams called “structures of feelings”, the lived experience of the shared culture of global, monopoly capitalism mediated by national, often jingoistic cultures. The economic crisis opened a window of opportunity for re-thinking the objectives and strategies for democratic change, but it also generated conditions of inequality that have helped right wing forces achieve further hegemony by promoting struggles among the popular classes within and between nations. The Occupy and the 15-M movements as well as new political parties and social movements have tried to shift the axis of conflict by directing social unrest against economic and political elites. Today’s hope for the future lies in the capacity of these alternative forces to articulate viable solutions to confront the international oligarchy, austerity and the rise of the far right, address the refugee crisis, counteract climate change, reduce the risk of nuclear war and envision projects of egalitarian transformation that a majority of the population can find attractive, inclusive and realistic. However, the left(s) remain in crisis and the right(s) are gaining strength, especially among the working class. Populations are increasingly identifying with conservative and reactionary conceptions of the nation-state, while the lefts are incapable of providing an attractive, egalitarian and democratic project for the nation-state. At the same time, the transformative capacity of municipal governments is being strongly limited by the forces of the nation-state, the European Union and economic power. Many of the problems affecting populations at national and local levels have European and global dimensions. This means that the solutions also demand an international dimension. Therefore, a necessary and urgent task is to build, from scratch, a pan-European historical agent of change that does not exist right now. This is an extremely difficult objective to achieve, but it is the only chance of transforming (and possibly saving from itself) the European Union to build more egalitarian societies which can offer democracy and security to its people, including the newcomers. One such project is promoted by Transeuropa, a transnational artistic, cultural and political festival organised by European Alternatives since 2007. 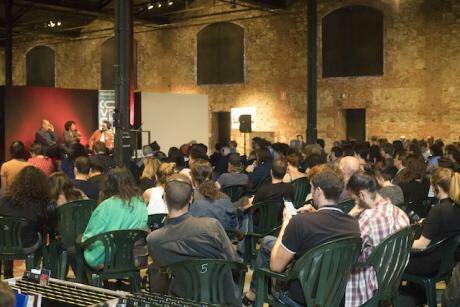 This year, Transeuropa met on 24-29 October in Madrid and brought together activists from around the continent and beyond to promote pan-European (and global) processes of solidarity through a variety of talks, workshops, exhibitions and concerts. An important array of discussions took place around immigration and the crisis in the welcoming refugees. Participants shared a commitment to oppose nationalism, racism and Islamophobia by promoting solidarity among Europeans and with the populations of other continents that are forced to flee their homes. Transeuropa wants to confront the exclusionary logic that is gaining momentum in Europe by connecting cooperativism and municipalism with Europeanism through the Commons that the cities of change are trying to put into practice. This involves re-thinking urban politics, the tax system, redistribution policies as well as the transformation of other material sites of struggle. Marina Garces and Niccolo Milanese on 'Thoughts for a future below and beyond the nation, October 28,2017. Transeuropa Festival, Madrid. Photo: Elisa Sánchez Fernández.All rights reserved.Pan-European transformations also require a re-framing of the cultural wars through the development of new communication strategies that promote solidarity and unity from below. Transeuropa proposed innovative communication practices through artivism, digital technologies and civic video games. Cybersecurity for activists was also discussed in detail. Feminism was agreed fundamental in the transformation of both the material and the cultural sites of struggle, because a de-patriarchialisation of politics is deemed necessary to distribute power and transmit values of mutual support that can bring people together around common, humanistic goals. 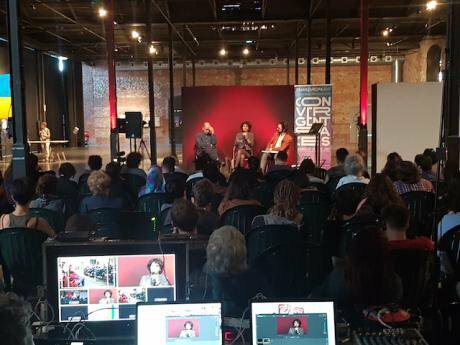 Intersections of gender, “race”, disability, sexuality and class were explored as a framework to connect struggles for social justice through practical, everyday intersectional organising. In this way Transeuropa engaged in practices of cultural politics by opposing emancipatory cultures to the authoritarian and exclusionary logics imposed by the EU and nation-states. More and more spaces like this for grassroots exchange are needed in today’s context of multiple, interconnected crises. A multiplication of these spaces would contribute to developing an informed, militant hope one day able to harness international support. As the EU moves into a deeper crisis in the future, the intervention of pan-European projects for egalitarian change like Transeuropa, European Alternatives or DiEM25 may become increasingly attractive in the face of the possible fragmentation and disintegration of the EU. These projects are very welcome. But to become hegemonic in a context of rising authoritarianism and unequal power relations, the forces for pan-European change will have to carefully rethink their strategies. As reactionary forces get stronger, egalitarian movements really need to hit the mark by weighing the opportunities and limitations of the possible strategic alternatives. So, what were the key strategic lines of Transeuropa? The festival was conceived as an open space for convergence of political, artistic and civil society actors. It was a call for dialogue and exchange of ideas and projects not only focused on resistance, but also on building alternatives. Transeuropa, thus, attempted to bring together a plurality of dispersed forces around Europe to help them work together at a transnational level. The idea of convergence has of course been explored in the past, for example by the Red de Convergencia Social since 2011 or the political projects to articulate different left-wing forces for “popular unity” in Spain (for example, the confluencias). So far, this strategy has been insufficient to confront the immense power of right wing forces at the level of the nation-state. One important limitation of convergence is that it has not been sufficiently appealing for a majority of the population (the ‘outsiders’), which rejects left identity and ideology, as fast as they are dressed in new and popular clothes. For example, after attempting a populist strategy and due to internal fights, Podemos tried to articulate the convergence of already existing left-wing forces and social movements, but with deteriorating results. The leadership of Podemos then decided to address the conflicts within the confluent forces by adopting an oligarchic model that silences plurality and imposes a monolithic party line from above. Strategies of confluence and popular unity played an important role in winning the municipalities of major cities of Spain like Madrid, Barcelona and Valencia, but hit important limits as their transformative capacity was constrained by the Spanish state and the EU. Moreover, convergence has faced its own limits as the historical tendency of the left to engage in factional fights has generated divisions that make it difficult to confront the huge power of national and international elites. These dual difficulties in attracting outsiders and the development of internal factionalism can also jeopardise any potential for a trans-European convergence. However, this is another approach that could be a starting point for internal discussion that leads to strategies to reach wider sectors of society. The strategies of convergence, as well as transversality, populism and oligarchy have all demonstrated their insufficiency when it comes to transforming power relations. An alternative approach may be to follow a class analysis, promoting alliances between the middle and the working classes. The crisis of the left is deeply connected to its difficulty to reach the popular classes, due to this lack of a clear and viable proposal, but also due to sectarianism, élitism, and obscurantist language. Forces for egalitarian change have been disconnected from the majority of the population for decades and especially from the working class, the “losers of globalisation”. With the defeat of the working class over the last 40 years, progressive forces have lost a key actor for resistance and change. TransEuropa Festival, Madrid. Elisa Sánchez Fernández. All rights reserved.Today, social and political forces for democratic change are mainly composed of middle class, young people. However, socio-political change only seems feasible through an alliance of the working and the middle classes against the international oligarchy. The current disconnect between both classes was also reflected in Transeuropa and continues to be one of the main problems the left(s) are facing. If egalitarian social movements are not with the working classes, it is easy to imagine who is keeping them company. The absence of the “white”, manual working class is indicative of the split between progressive forces and their traditional supporters. Therefore, it is clear that a key objective of egalitarian movements must be to re-connect with the working class. Working class people often find left wing activities paternalistic towards them and pulling the heartstrings most strongly for other people. So open spaces really need to be inclusive of different classes, identities, mentalities and cultures. And social movements need both to include more working class people and to conduct further class analysis to accompany the analysis of gender, race, sexuality and migration. One of the most controversial elements of the strategy proposed by European Alternatives and Transeuropa has to do with the understanding of the role of the nation-state. The premise is that nation-states are no longer able to influence the global trends that affect people’s lives and, therefore, that it is time to look at what comes after the nation-state. The proposal is to look below and beyond nation-states to build a model of joint governance between the municipal and the European level. This strategy of bypassing the nation-state contains important limitations which have dramatically reduced the transformative capacities of social movements since the anti-globalisation protests of the 1990s. There is a problem in the diagnosis, because nation-states continue to play a fundamental role in the promotion of globalisation and the organisation of societies. With the demise of the welfare state, nation-states have ceased to provide a reasonable degree of security and wellbeing to citizens, precisely because they have changed their role to drive the processes of deregulation, privatization, financialisation, militarism and austerity that characterise globalisation. The proposal to bypass the nation-state undervalues the power of state structures to maintain the social order. Moreover, there are few current examples of the nation-state being successfully challenged from below. On the contrary, we see how the nation-state imposes its power upon municipal governments seeking change in fundamental respects, including democratic decision-making, the refugee crisis, house evictions, austerity budgets, freedom of speech and the health system. At the same time, the EU is also imposing limits on national and local governance. Therefore, transformation at all three levels is required if we are to avoid voluntarism – the naïve belief in the omnipotence of ideas. Ideas can only be materialised when they are rooted in actual existing conditions; when these conditions make possible the agency that can bring about real change. Moreover, this approach undervalues the capacity of employing the state to protect people and redistribute wealth and power. States are authoritarian power structures, but they can also contribute to protecting citizens and even improving the conditions of freedom and equality that allow people to take some control over their lives. As Chomsky has emphasised, basing his arguments on the thoughts of workers’ organisations in Latin America, we should “expand the floor of the cage” to protect ourselves from the predator outside, namely the economic powers. Once sufficient strength has been accumulated, the cage of the nation-state may be dismantled, but not before. While the idea of bypassing the state may only generate more vulnerability, developing democratic states can contribute to both a redistribution of wealth and a decentralization of power. Recent reforms in favour of equality by the coalition government in Portugal show that there is a margin of action for nation-states, even within the current EU. Nationalism surely has to be confronted, but the mobilising capacity of nation-states, as well as their power to make societies more democratic or more authoritarian cannot be left in the hands of the right. If we are focused on the municipal and European levels, the right will be able to strengthen its grip on the feelings and the power structures of the nation-state, thus preventing any possibility of municipal and European democratic governance. Progressive movements would only become more disconnected from the general public and the working class. In today’s adverse context, social movements should not renounce to any site of struggle for hegemony and transformation. There is a need to engage in transformations below and beyond the nation-state, but also at the nation-state itself in a multilevel strategy. Social and political movements should avoid further wishful thinking that is not appealing to a majority of citizens or leads to setbacks. They have to operate from existing conditions that provide opportunities and establish limits. It would be a mistake to dedicate the limited resources available to engage in projects that are not able to include the working class and the national framework that is so important for many people. Progressive movements should not leave them in the hands of the political adversaries since it is clear that one of the reasons why the right is winning is because the left has not been able to propose attractive projects for the nation-state. They should identify objectives for which appropriate means are available. They should transmit clearly that they know how to achieve their objectives. The possibilities of transforming societies in Europe in a more egalitarian and democratic direction are limited, but there is room for manoeuvre at every level. This is why it is fundamental to follow a multidimensional strategy that focuses on the different scales of social change – local, national and international – and on the different dimensions of oppression and emancipation – class, gender, race, sexual orientation, etc. It is furthermore necessary to connect the local, national and international levels to produce egalitarian changes in all three levels. This brings us back to the transformation of both cultural and political-economic realities. Amidst a deep crisis of the left(s), a plurality of organisations are attempting to promote new projects of solidarity to re-invent the cultures, politics and societies of the twenty-first century along democratic and egalitarian lines. As oligarchic power continues to concentrate and the European Union imposes a unidimensional societal model based on neoliberalism and austerity that exacerbates inequality and reduces democracy, the hope for rebuilding Europe lies in the hands of initiatives such as Transeuropa. A strong, pan-European social and political movement is needed to confront the regional and global challenges that societies are facing today. But this can only develop by connecting it to local and national processes of transformation. Each space has its own rhythms and priorities. Changing the power relations at the nation-state level can contribute to promoting both municipalism and Europeanism. A possible, future unity of several progressive governments and social movements from different countries may be able to build sufficient strength to attempt the transformation of the EU and confront the international oligarchy. To achieve this, middle class socio-political movements should connect again with the working class and build interclass and intersectional alliances that can compete against the 1%. The difficult alliance of the working class and the interculturalists could provide sufficient strength to transform power relations and lead to democratic and egalitarian transformations. But this alliance remains a huge, multilevel challenge.